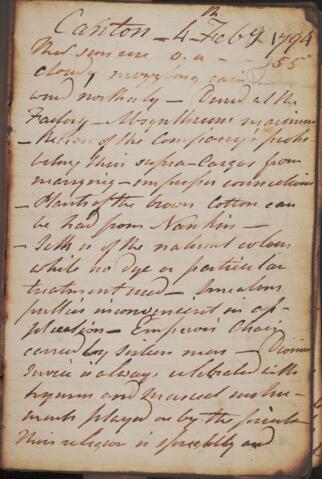 This personal journal written by James Dinwiddie spans the period of February 4, 1794 to March 23, 1794. During this period, Dinwiddie visited China, staying in Canton (Feb. 4 - Feb. 23) and Macao (Feb. 24 - Mar. 9? ), and spent some time at sea.